ENL includes not one but two value concepts: potential value and effectual value. Both relate to use-value, and both are derived from the work of John Ruskin, a 19th century social theorist who wrote several books on economics. The value concepts were introduced in Munera Pulveris (1862), although Ruskin actually referred to "intrinsic value" instead of "potential value". Potential value, when positive, is the maximum capacity of a final output, over the duration of its useful existence, to increase health. If an output has the opposite effect—if it decreases health—its potential value is negative. Based on the assumption that a consumer can always be found to extract the maximum health benefits from an output, potential value is the same at any output quantity. Potential value is used in ENL to judge the quality of outputs resulting from production. The key word in the above definition is "capacity." An apple, for example, has the capacity to increase health, but it can also be thrown away or allowed to spoil. Its health benefits constitute only a potential, which may or may not be realized. The apple has to be eaten, while it is reasonably fresh, by someone who can assimilate its nutrients. Only then will its potential health be fully transformed into actual health. The time element is crucial when dealing with health. A specific health increment that lasts for 20 days is 10 times greater than the same increment that lasts for two days. An apple, for instance, might increase health by ten units on the physical health index (PHI) for three days, while a house might increase health by eight PHI units for 50 years. Although the apple has a greater short-term health effect, the house has a much greater long-term impact, and thus a much higher potential value. Final outputs are objects and services that are directly consumed, such as food, furniture, and haircuts. This is the only type of output that has potential value. Final outputs must be distinguished from intermediate outputs such as raw materials, tools, and machinery. While intermediate outputs are essential to most economic activities, they are not consumed as end products and do not contribute directly to health. They therefore fall outside the definition of potential value. 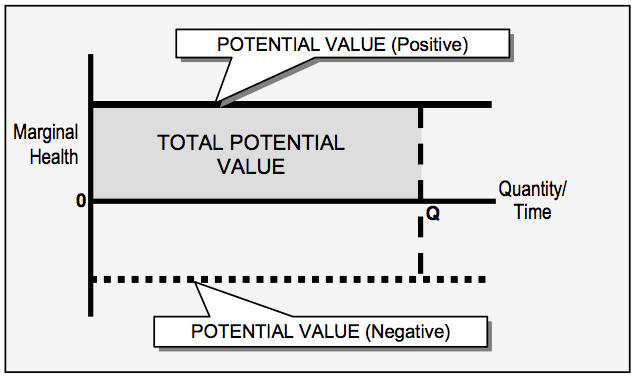 As stated, potential value is a constant quantity, and is therefore plotted on a graph as a straight, horizontal line. This line can be in the positive or negative range, or it can be zero. Potential value is the capacity to increase or decrease health through consumption. It is assumed that this capacity can always be realized, so the potential value curve is a straight, horizontal line. Several points should be made to clarify the meaning of this graph. First, the two axes do not necessarily relate to the same time period. The horizontal axis represents the quantity of an output produced over a specific period of time, such as a day, month, or year. The vertical axis represents the health effects of these outputs for as long as these effects last, which may be longer or shorter than the production period. Assume, for example, that a year is chosen for the production period and that the output is houses. If 50 houses are produced in a year and they last for an average of 60 years, then the horizontal axis will show 50 houses per year, and the vertical axis will show the health effects of these houses over the 60 years of their useful existence. This approach is necessary if we are to compare the overall value and cost of outputs, and thus to accurately establish their optimum quantities. The second point relates to the orientation of the two axes. Mathematicians place the independent variable (roughly: the cause) on the horizontal axis and the dependent variable (roughly: the effect) on the vertical axis. In standard economics, however, the axes are often reversed. Especially in supply-demand curves, economists use the vertical axis for the independent variable (price), and the horizontal axis for the dependent variable (quantity/time). Most economists have become so accustomed to this reversal that they no longer notice it, and few textbooks even bother to point it out. The practice in fact dates back to Alfred Marshall's Principles of Economics (1890). Although Marshall was a mathematician as well as an economist, he switched axes when introducing supply-demand graphs to the world, and this has never been corrected in the Anglo-American world. ENL's graphs, like those of the French, follow mathematical convention. In most cases this means that quantity per unit of time is on the horizontal axis, and marginal health is on the vertical axis. We are therefore tracking changes in health resulting from changes in the rate of output production and consumption. With these initial comments out of the way, let's examine the graph itself. The quantity of the output being produced, per unit of time, is on the horizontal axis, which is also called the X-axis. Marginal health is on the vertical axis, also called the Y-axis. The "Q" is used in all ENL graphs to represent the current output quantity per unit of time. The total potential value of this output over the specified time period is the area under the positive potential health line, from quantities 0 to Q. This is the shaded area in the diagram. Because ENL is intended to provide broad economic guidance, the output here is presumed to represent a general category: vegetables rather than carrots, gas-guzzling cars rather than a specific luxury brand. It is also important to underscore that quantity is a shorthand for a rate: quantity/time. This is done partly for brevity and partly because it is consistent with the graphs used in the standard discipline. Although the potential value of an output is fixed at any particular time, it is not necessarily fixed over time. Food provides a particularly worrisome example of decreasing potential value. Such decreases would be represented by the downward shift of the positive potential value line from one time period to another. Potential value is readily understood with respect to food because this is ingested and assimilated—the intuitive meaning of "consumption". The same thing is true for cigarettes and drugs. Something is socially necessary when it is indispensable under prevailing social conditions. Something has positive potential value when its consumption directly increases health. Although indispensability and health may be practically linked, they are not logically associated. This example is worth pursuing to clarify the meaning of potential value. If we exclude a car’s various amenities and focus on the vehicle itself, what do we have? An enclosed space with windows that can move when it is mechanically sound and supplied with fuel. Movement can provide exhilaration, possibly augmenting health to a small degree, but it can also cause accidents, thereby decreasing health or causing death. On the other hand, a non-moving, enclosed space can serve as a residence, which will, depending on climate, increase the occupants' health relative to living outdoors. A car's potential value is the sum of factors such as those cited: exhilaration, accidents, and living space. Many others could also be mentioned, such as the inhalation of fumes from surrounding traffic and the obesity resulting from inactivity while the driver is behind the wheel. The issue requires formal study, but it appears likely that a car's overall potential value is negative. The fact that a car nevertheless has high subjective use-value for many people, and thus commands a high market price, does not alter this conclusion. The subjective perception arises largely from factors such as the long distances from home to essential destinations, the hassles and delays involved with public transportation, the privacy of a personal space, and the status associated with conspicuous consumption. While these factors may amplify subjective desire, none of them significantly increases health in the objective sense. Let's consider a car that transports a doctor to a hospital in order to perform a life-saving operation. Does a car not have significant potential value when it is used in this manner? The answer is no. If the doctor lives 20 kilometers from the hospital and must get there quickly, a car will likely be necessary, but this necessity does not translate into potential value. If it did, an economy's total potential value would be increased simply by moving all doctors to homes that are further removed from their associated hospitals. We would thus fall into the same trap as the GDP measure used in standard economics, which absurdly counts all economic activities on the positive side of the ledger. In instances such as this a car helps us overcome an obstacle, namely distance, to a health-increasing service—the operation. However, it is only the operation itself that actually improves health and therefore has potential value. The car is entirely a cost element. The economy would be improved by reducing this cost through such measures as moving doctors nearer to their hospitals and by bringing hospitals closer to their patients through the decentralization of health services. It is important to recognize the principle here: whatever is necessary to production but does not directly increase health is a component of cost, not value. In a rational economy such factors will be minimized, and if possible eliminated. They should be increased only if they are indispensable under prevailing social and economic conditions, and if these conditions for some reason cannot be altered in the time available. 1. Joseph Schumpeter, History of Economic Analysis (New York: Oxford University Press, 1954), 991. 2. Thomas F. Pawlick, The End of Food (Vancouver: Greystone Books, 2006). These observations are not new: the nutritional disaster posed by soil depletion was spotted 60 years ago by Aldo Leopold. See A Sand County Almanac (1949), p. 222. 4. An apparent breakthrough in this area is the electronic cigarette, which does not burn tobacco. It dispenses nicotine by vaporizing a liquid, but does not produce tar or toxic smoke, thereby reducing the health risk for both the smoker and those in the vicinity. 5. This is similar to the confusion, pointed out by Marx in Capital, between a necessary and a value-adding factor in capitalist production.